It’s not always warmer on the other side of the hill (or beyond the Michigan borders). November can be gray and unpredictable, so we decided to hightail it to North Carolina to bask in warm sunshine for a week or two. At least, that was the thought…. 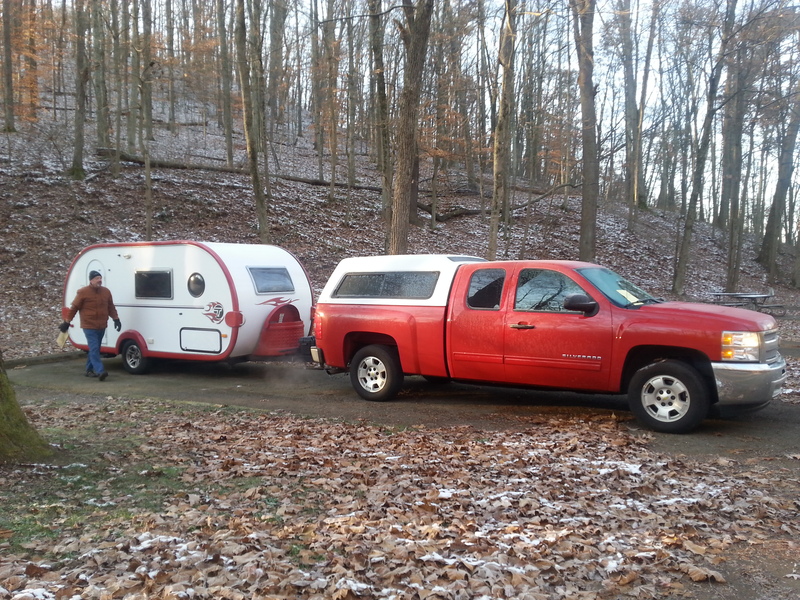 John winterized the Fireball in Michigan, knowing that we would be towing through temps in the low 30s and 20s. Onboard were two gallons of water (no matter what, we require coffee in the morning). First destination? Lake Alma State Park in Southern Ohio somewhere. Over 400 miles, which is a very long day in the truck for us. We arrived at 5ish, leaving enough time to get setup in fading light. Electric service – great! We can use our little electric space heater, and not have to use propane in the furnace. No water, and no hot water, since that’s all part of the winterization process. There are some pretty rugged pit toilets in the park. Ugh, but it’s only for one night. O.M.G. It was cold! 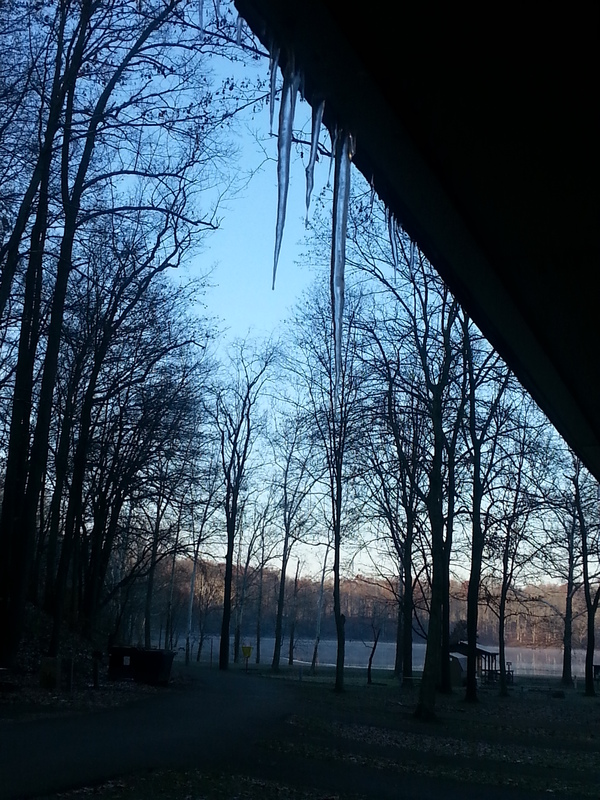 Any body part sticking out of the blanket was frozen (admittedly, we do keep heat at a minimum at night). Temps dipped to about 22 – by far the coldest night we’ve ever spent in the Fireball. Brrrrrr, but we’re headed to North Carolina! That’s in the South! It’s warm there, right? 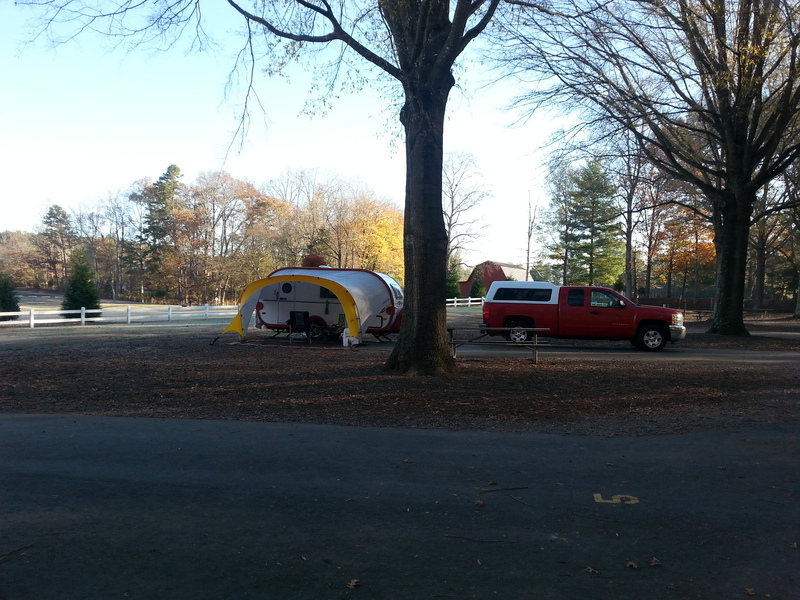 So here we are at Tanglewood Park in Clemmons, still freezing. It hit 19 last night. Our water hose is hanging on a fence in the bright sunlight, as we try to thaw it. We’re hoping this is the last of the supercold. At least the bathrooms here are pristine, and the showers are hot. We’re being joined in the next couple of days by other campers with T@Bs and T@DAs as we toast the completion of another camping year. Always fun to meet other folks and share ideas for simple camping. Now, if it would just warm up 20 or 30 degrees….. 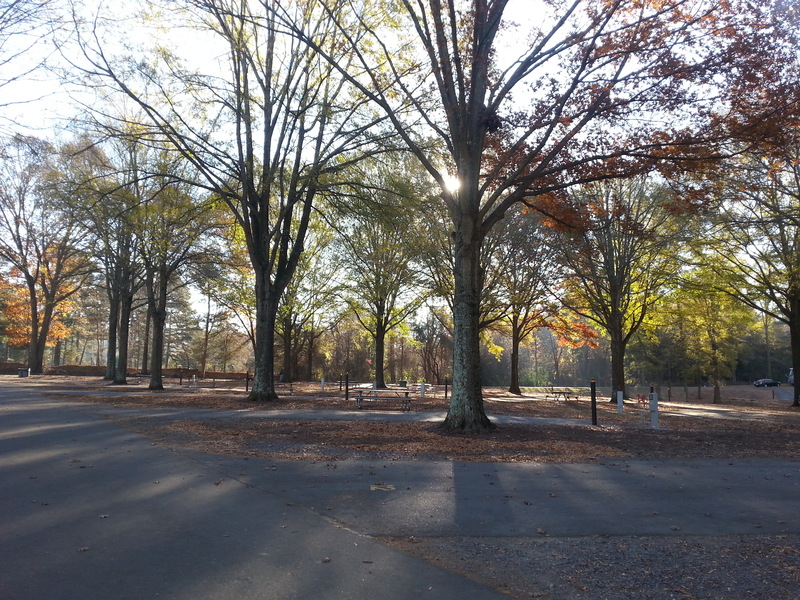 This entry was posted in camping, great outdoors, North Carolina, retirement, simple camping, T@B, T@DA, weather and tagged camping, simple camping, T@DA, the great outdoors, weather by Judy Crankshaw. Bookmark the permalink. You are not far enough south for it to be warm yet. To us, North Carolina is “way up north.” It gets COLD up there! All kinds of crazy little campers here….we’ll survive, I’m sure. Photos to follow in a day or so. I used to love cold weather camping. But that was when I was a little bit younger than I am now! If you are in good company, it will be a lot more fun! We’re in Fredericksburg, Texas which is about the same Latitude as the Florida panhandle. It has gotten below freezing two nights in a row. There is a slow warm-up predicted. Hope things warm up for both of us! What I’ve always loved about tent camping in cold weather is how snug and warm the tent becomes. Not quite the sane in the Fireball but we’re thrilled to sleep in a real bed. We just put another log on the fire on your behalf up here in frosty Vermont. Have fun! Used to go to Tanglewood when I was a teen growing up in Greensboro. You guys should “swing by” our place in Newport News, VA. Room in the driveway for your rig! Think we are going to head toward Great Smokey Mtn park when we leave here. Should be warm there,right? ;-). Why don’t you and Sheila join us?